Every so often, something so incredibly useful comes out that you wonder why nobody thought of it before. 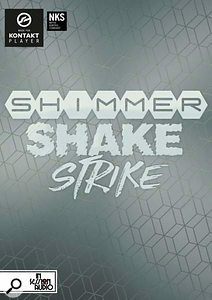 Shimmer Shake Strike (henceforth SSS) is just such a thing. This Kontakt instrument is a one-stop shop for all your top-of-the-mix percussion needs, bursting with a comprehensive collection of shakers, tambourines, cowbells, claves, claps and many more. These are brought to life by a trio of very clever step sequencers, more on which later. Two versions of SSS are available: the standard version ships with five tambourines, 12 shakers and 33 struck percussion instruments; the expanded version doubles the number of tambourines to 10 and the shakers to 24. 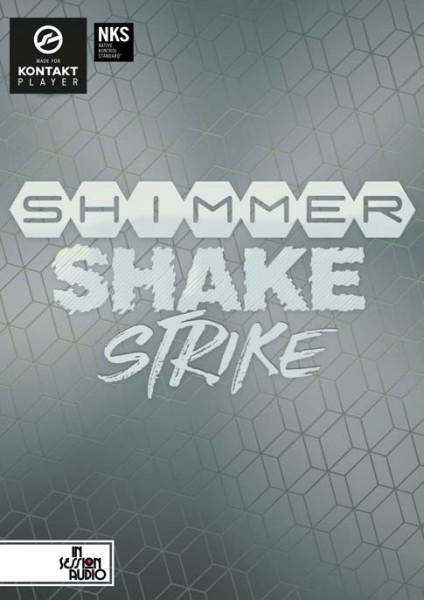 Hosted in a large-format GUI, SSS can independently sequence any three instruments taken from three categories, unsurprisingly named Shimmer, Shake or Strike. No prizes for guessing which kind of instrument falls into which category. The Main screen displays the three currently selected instruments, with accompanying colour photos (this is one of the most attractive Kontakt GUIs I’ve seen), with mute, solo, output, volume and pan controls for each. A handy key map graphic is overlaid, showing the various performance areas and a number of keyswitch functions, with a Link on/off option. The eight lower F1 to C2 keys trigger different tempo-synced patterns, whilst individual one-shot hits and rolls can played from E3 upwards, either all three instruments simultaneously or individually, depending on Link on/off status. The F#, G# and A# keys trigger one-shot rolls, each offering one of five dynamics ranging from soft to hard, with separate attack and release controls. Strike instruments have no rolls, which kind of makes sense — although it would have been nice if an exception had been made for the triangles. Low keys C1 to D1 act as solo on/off switches for each instrument. You can get a groove going right away by selecting one of the 184 snapshot presets (84 in the standard version). These come with rhythms in 3/4, 4/4, 4/4 triplet, 5/4, 6/8 and ‘high end’ variations, in various instrument combinations, each having eight keyswitchable patterns. The preset grooves and combos are highly usable straight out of the box. Alternatively, select the ‘Init’ snapshot and head on over to the Pattern screen to create your own from scratch. This screen contains three step sequencers, one for each instrument. Each sequencer comprises a row of either 16 or 12 ‘ladders’ according to the selected grid setting; there are seven ‘rungs’ to a ladder: the first five represent dynamics from soft to loud, the top two trigger a pair of 32nd notes and a 32nd note triplet respectively. Simply drag the square white knobs up or down the ladders to select the appropriate dynamic for each step; drag them away off the bottom to ‘mute’ a step. That’s all straightforward enough, but SSS has a fiendishly clever trick up its sleeve. The makers have taken ballistics into account, specifically regarding shakers and tambourines, recognising the way in which the beads and jingles, or ‘zills’, move with changing dynamics. So rather than the simple alternation of soft and loud dynamics as in a ‘normal’ sample triggering scenario (for example: p, p, f, p, p, p, f, p), SSS knows that a loud sample should be preceded by one where the beads or jingles accelerate towards the loud hit, and followed by one that decelerates out of it, so it replaces surrounding softer samples with the appropriate ‘ballistic’ movements to glue it all together. The above example then becomes p, accel, f, decel, p, accel, f, decel. The extra level of realism this brings is, to quote the late David Coleman, quite remarkable. Numerous other factors alter a pattern’s behaviour: Strike instruments have a Humanise function to tighten or loosen their timing, and patterns can be shifted backwards or forwards in one-step or one-beat increments relative to each other. Global controls include Swing amount and the option to play everything in straight, triplet or half time — a very useful bonus. The default pattern length is 16 steps, but you can specify anything from two to 64, allowing for long evolving patterns and exotic time signatures. Better yet, the step length (ie. time signature) can be different for each of the eight patterns, so prog rockers can groove away with confidence. The Mix screen provides comprehensive per-instrument tone shaping: tune, volume, pan, four-band EQ, plus delay and reverb sends for each instrument. Bi-directional tone controls function as low-pass (anticlockwise) or high-pass (clockwise) resonant filters with variable cutoff frequency. The Master FX section provides global four-band EQ, compressor, tape saturation, stereo delay, and convolution reverb with four impulses. Every adjustable mixer parameter can be assigned MIDI controllers, so anything here can be manipulated on the fly. The designers seem to have thought of everything, including putting volume, pan, mute and solo controls on every screen so you can focus on any instrument from whatever part of SSS you’re working in.